Wow! That's probably one of the best Gmaps mashup I've ever seen... And that's an awesome solution for the size problem you came up with. I've read your blog for a long long time and this post tipped me over the edge to make a comment - I love it, serious kudos for putting such effort in and making such a slick hack. You rock. Very nice done! 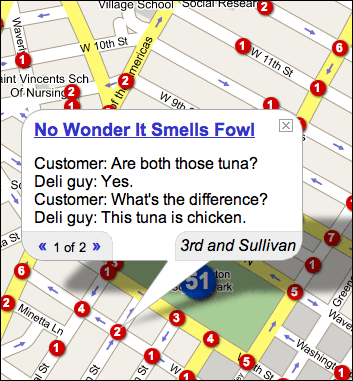 Yet, i did not found all overheard in NY quotes on your map. Why? Feature suggestion: If there was something like "link this page" one could send cites to friends. Very nice work! and very good explanation as well!! BTW, is the data feed dynamic? or it's pretty much static? I really like the way that you combine multiple quotes into a single overlay object and I have found a way to do something similar, but I have issues with the overlay not resizing if the content grows after the overlay is initially displayed. Could you give me any tips on how you get the overlay to resize based on the size of the quote as you click through multiple quotes? Maybe just point me to the right place in code so I can work on understanding how you have accomplished this. Chris, you can look at QuoteSet.prototype.displayQuote in http://persistent.info/overplot/classes.js to see how I handle refreshing of the info window. Basically toggling the display of the contents and calling openInfoWindow makes it refresh. Very nice mashup. I think that's the best one I've seen. Killer work!! This is very interesting indeed. With your permission, I wanted to implement the neighborhood part into my map. But keep some parts in particular my info window. I just commented out the parts about the points from your code but I am having two issues. I managed to get the neighborhoods to work but I am having two problems. 1- I can not click on my markers anymore. 2-i can not get the neighborhood overlay to clear for zooms higher than 15. Is there any suggestion so I can just get the neighborhood map?